Following a controversial motion to request the resignation of Associated Students Executive Director Marisela Márquez, several A.S. staff members closed their offices on Thursday in solidarity with Márquez. The motion, which failed at Wednesday’s May 25 meeting in a 11-6-1 vote, was discussed exclusively between senators in a closed-door meeting. 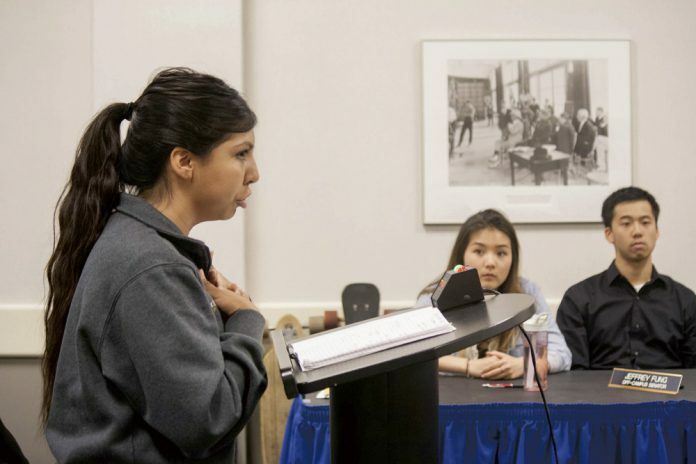 Upon reconvening for quarterly reports, A.S. President Jimmy Villarreal and External Vice President for Local Affairs Paola Dela Cruz expressed concern. As for Senate’s decision to discuss the matter privately, Dela Cruz said she was “ashamed” at the lack of dialogue present throughout. Hours after the Senate meeting, A.S. Assistant Director for Community Affairs Aaron Jones released an official statement via email to all concerned entities. In the email, Jones affirmed the values of the Association as a whole and expressed both shock and a personal sense of failure on behalf of Senate’s decision to discuss the motion behind closed doors. The following morning, Jones and fellow A.S. staff discussed the decision, releasing a letter addressed to Senate later that day. The letter, expressing a collective sense of hurt, confusion and disappointment, was signed by 19 A.S. staff members. As promised in the letter’s closing line, many staff members closed their offices for the day. In response, A.S. Internal Vice President Kimia Hashemian disclosed a letter to all A.S. entities at 6 p.m. on Thursday. Despite inquiries from both A.S. staff and campus media to disclose information discussed during Wednesday night’s closed meeting, Hashemian only added that the evaluation of other staff members in the coming weeks was also discussed. She remained confident in Senate’s decision to keep such information private. On Friday, at 8:33 a.m., A.S. Attorney General Brandon Lee confirmed that the decision to hold a closed meeting was valid according to the California Brown Act under Chapter IV, Public Notice, Closed Session Agendas, and A.S. Legal Code Section 3.A. Lee also upheld the right of A.S. staff to close offices on Thursday afternoon. The 65th A.S. Senate body of 2014-2015 also released a statement Friday afternoon. Though they upheld the 66th Senate’s right to issue the motion within a closed meeting, 18 former senators and 3 former executive officers — whose names were included to show solidarity — also emphasized Márquez’s “tremendous support and commitment”. El Congreso, as well as the 2016-2017 A.S. Executives echoed sentiments, releasing similar statements via Association wide emails and Facebook. Students with MUJER, an Office of Student Life Group advised by Márquez, plastered the halls of A.S. with posters Thursday night. Villarreal, with no further information on the continuing Inter-Fraternity Council investigation, is currently looking for senators to fill vacancies for the interim until new senators are sworn in. Temporary senators must be members of A.S. and enrolled in summer school. A.S. also created an online space where students may evaluate the performance of A.S. staff members for the 2015-2016 year. With that, the 66th A.S. Senate concluded its term for the 2015-2016 academic year.